Home › News › The Anatomy of a Cufflink, So Many Variations! The Anatomy of a Cufflink, So Many Variations! 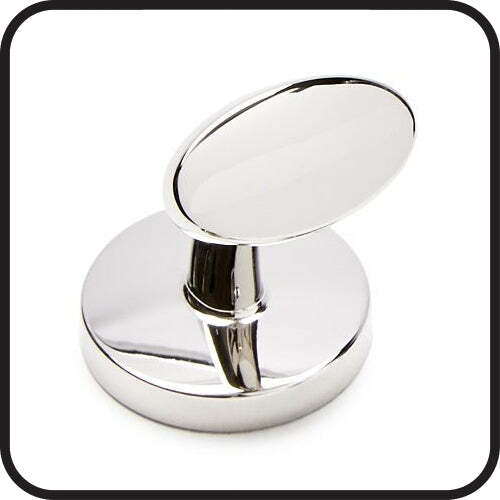 I've searched around trying to find some consistent information about cufflink. There are some great sites that talk about the various types, but I see many conflicting statements that confuses particular designs with a type of cufflink. So I decided to attempt a definitive classifications of cufflinks. A perfect example are Ogham cufflinks. Ogham is not a type of cufflink, but an Medieval alphabet used to write the early Irish language. They were primarily inscriptions found on stone monuments throughout Ireland and western Britain. The same would be true for "Celtic cufflinks" and "Calibre Cut Cufflinks". 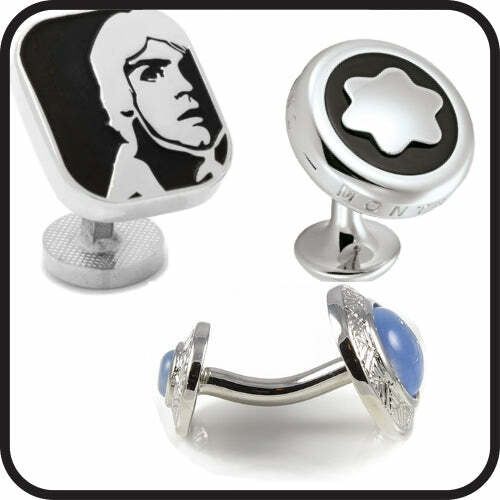 These are just types of designs can be incorporated in to the face of the cufflink, not types of cufflinks. The face is the part that most people think of when referring to cufflinks. Using some similar logic, the cufflink can be divided into three major parts: face, backing and connector. I know there are other possible parts of a cufflink, however these are the minimum needed for a cufflink to provide its function of holding cuffs together. Here's what's I defined as the three parts. So now for a deeper dive into the sub-classes . . . 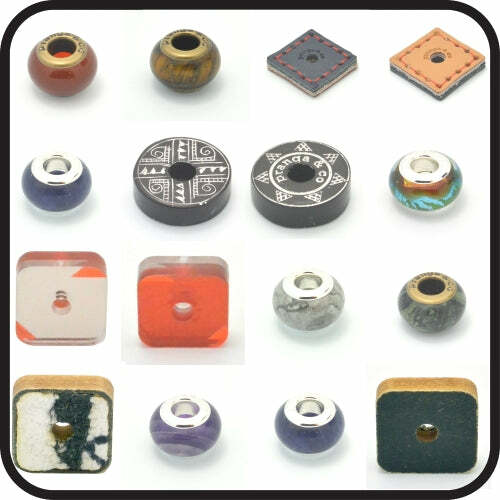 These faces are used on pranga's interchangeable cufflink system and unlike other faces are make from a large variety of materials. Many of the ankers are double sided with either different patterns, colours or materials. This utility allows for matching a wider fashion range. The ankers are also compatible with various charm bracelet systems like those from Pandora Jewelry and visa-versa. Just like the name describes, a ball shaped motif. The Barbell variety is the same as the Bell, but the back is also the same size as the face. The look was inspired from circus dumbbell weights that were common in the late 1800's. There are two varieties of batons in the marketplace, fixed and interchangeable but both have a similar stick shape. The fixed variety is permanently attached to the connector while the interchangeable version was first introduced by Cartier in the 1960's. The initial version from Cartier had batons motifs made coral, carnelian, lapis lazuli, rock crystal, onyx, tiger's eye and malachite sold in one set. Cartier reintroduced the system in 2018 with the set of batons made from striped chalcedony, silver obsidian, malachite, sodalite, and red tiger's eye. These batons are not sold separately and no known aftermarket exists for buying new batons. The fabric knot is a classic motif usually formed from two (face and back) conjoined monkey's fist or Turk's head knots. First introduced in 1904 by the French shirt maker Charvet and was made from silk. 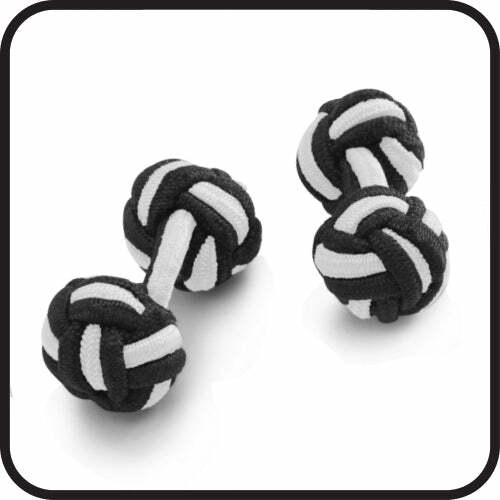 The modern fabric knot is made from fabric over an elasticated core. The knot shape can also be found made from various metals. 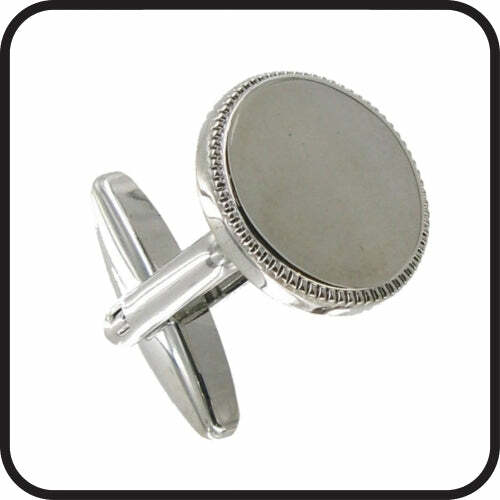 The reversible cufflink face is a good example of function and design. This allows for two different face motifs to be made into one pair. With the sliding version, a portion of the face and backing is fixed with a piece that can slide between the two ends. This sliding motif has a different look on either side which can be displayed depending on which end it is placed at. 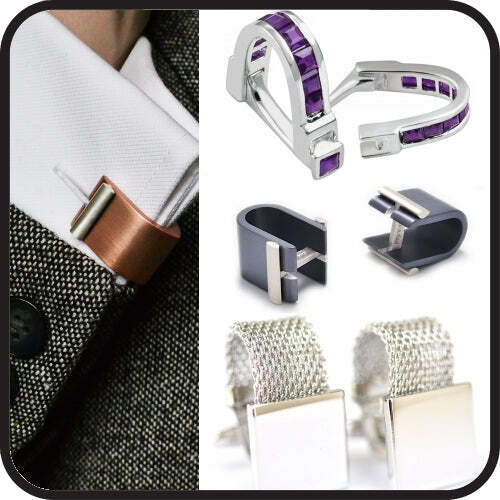 With the fixed reversible cufflink the face can also function as the backing and visa-versa. The backing and face each have a different design motif. 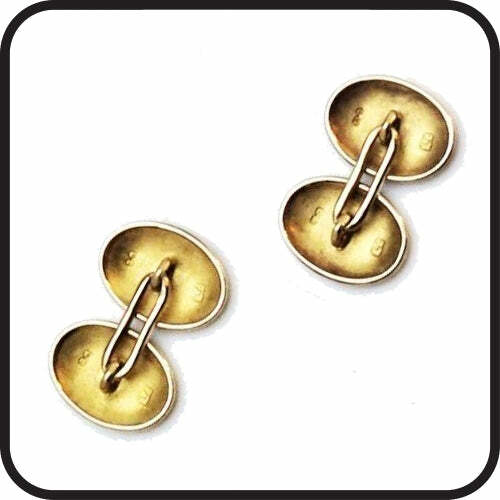 Some snap connector cufflinks have reversible designs. The basic design of the wrap around is a band going from one side of the cuff hole to the opposite cuff hole following the bottom contour of the cuff. Think of the band as an extension of the face allowing for a larger canvas to express design. The band can be made from a variety of materials including solid or mesh metal, leather or others. 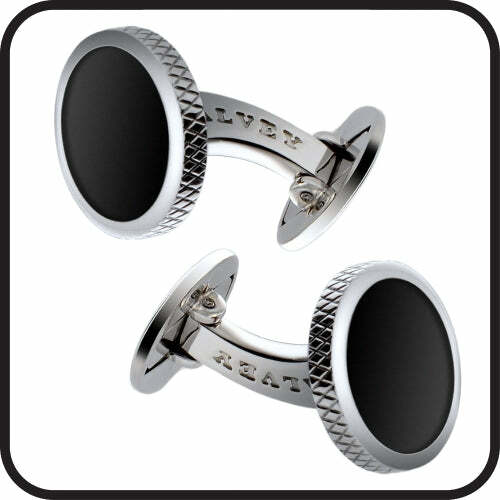 Some wrap arounds can be detached from the overall cufflink without impacting the overall function. The ball return is a simple fixed position backing that is semi-spherical in shape with a flat surface on the opposite side. The round side can easily slide through the cuff holes with the flat side then acting an anchor holding the cuff in place. One of the most unusual backing methods. 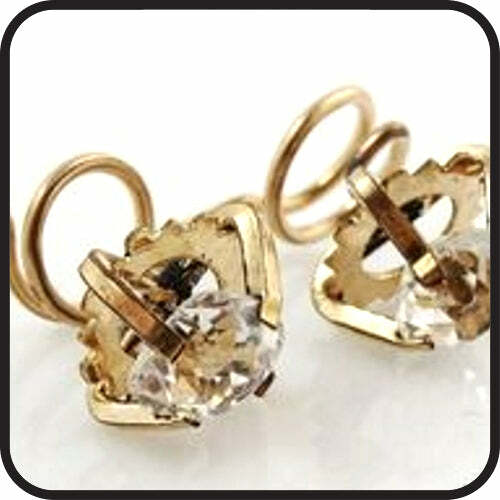 This function is similar to that of a corkscrew as you need to twist it through the cuff holes to get it into place. There is a longer vertical/horizontal piece that sticks out from the back of the coil that can rest flat against the shirt cuff. This helps prevent the cufflink from being dislodged and coming off. There are a variety of shapes and sizes of fixed backings. 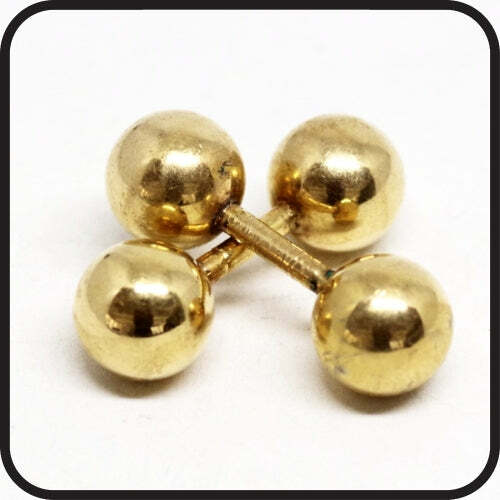 A Ball Return is also a type of specific fixed backing. They can come in a variety of shapes and sized, but they all are characterized fixed since they do not move or toggle. The toggle is by far the most common type of backing and are easy to use sliding through the cuff holes. Once the mechanism is through the cuff holes, the toggle is flipped usually at a 90° angle to the connector. 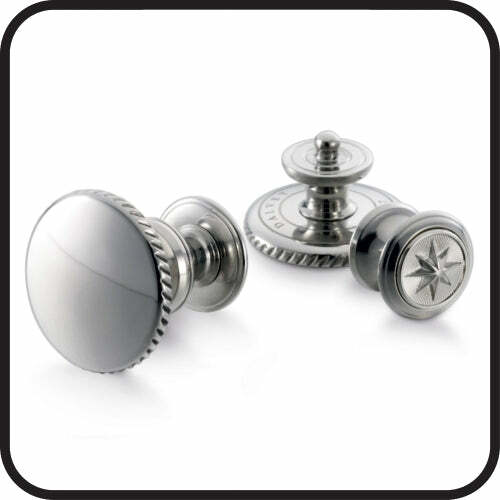 Toggles act as an excellent anchor keeping the cufflink in place against the cuffs. The difference in the various types is a matter of shape, with each being just as secure as the others. Bullet and torpedo toggles are very similar in shape, with the torpedo variety being more tapered at the ends. 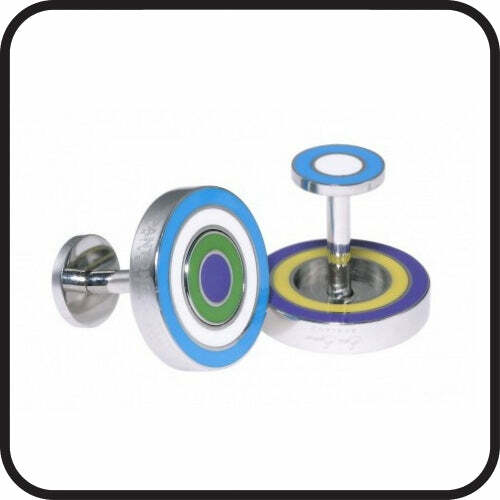 Whale toggles are somewhat larger allowing extra space for branding or logos. 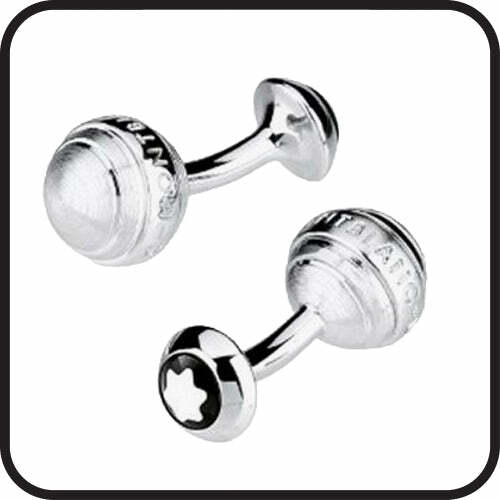 Similar in appearance to the whales, football toggles are shaped like their namesake. There are also round and oval toggle mechanisms. 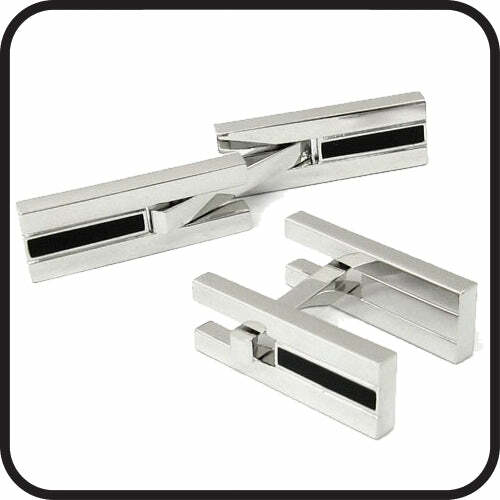 The bar connector is one of the most popular as it's easy to manufacturer and provides good strength to the overall cufflink design. There are three different versions, straight, curved and angled. There is no wrong way to wear the curved or angled cufflinks, but their center of gravity will usually dictate how they will "rest" on your cuff regardless of how they were initially put on. There are two variations of this connector, open and closed, both having a flat loop appearance. Both the face and backing pieces will have a small metal loop affixed to their backings, similar to how a pendant would be attached to a chain. The closed bridge does not allow for the face or backing to be removed. While the open bridge will have a clip type mechanism allowing for the face and backing to be removed and replaced. While not designed as an interchangeable system, the open loop was less expensive to produce and could allow for the changing of the face and backings. Bridge connections are not usually found in the market any more except for vintage or antique cufflinks. This is a simple chain connecting the back of the face to the back of backing with a sufficient length of chain (usually 20mm or less). The back of the face and backing have loops affixed to them like a pendant would have to attach to a necklace chain. Most faces and backings used with chain connectors will have decorative motifs and are usually reversible. Chain connected cufflinks can be a bit challenging to push through cuff holes as the connector is not stiff like other connections. 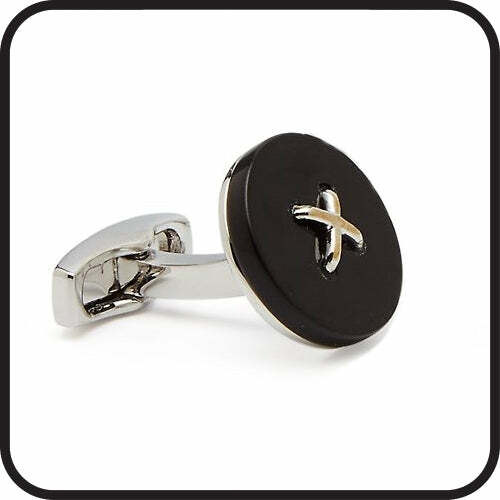 It can be easier to affix the cufflinks to the clothing before you wear it. There are two major interchangeable posts on the market today. The first was created by Cartier in the 1960's and consisted of a bar with a loop at either end that would allow a motif to be inserted at either end perpendicular to the bar. 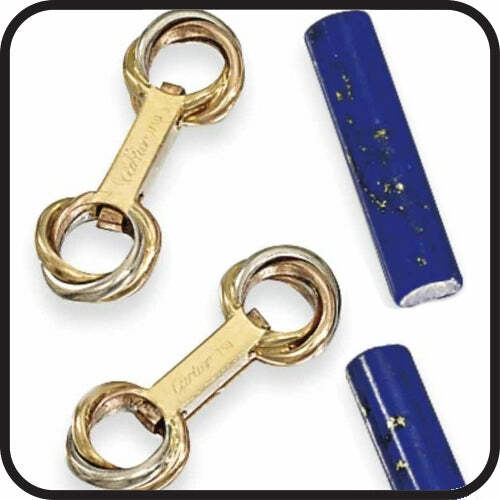 Cartier referred to the interchangeable motifs as batons. The second is patent-pending system developed by pranga and co. 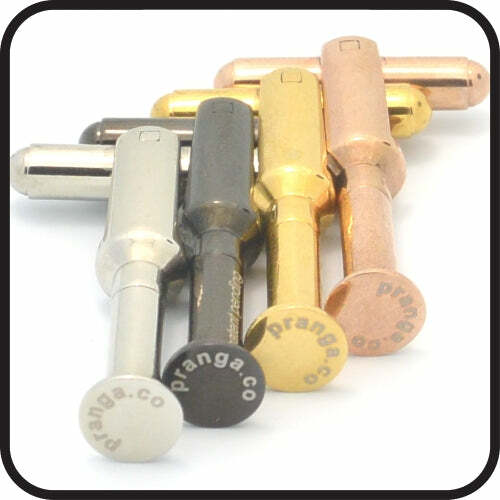 The connector in the pranga system comes apart allowing for the face, called an anker, to be inserted and complete the function of the cufflink. The connector is about 5mm longer than the average cufflink connector. This has the benefit of allowing for a large variety of face (ankers) to be used within the system. In addition, the extra space makes it easier for people to wear larger watches or smart devices on their wrists without them getting caught in the cuff. This can be an issue with some cufflinks. 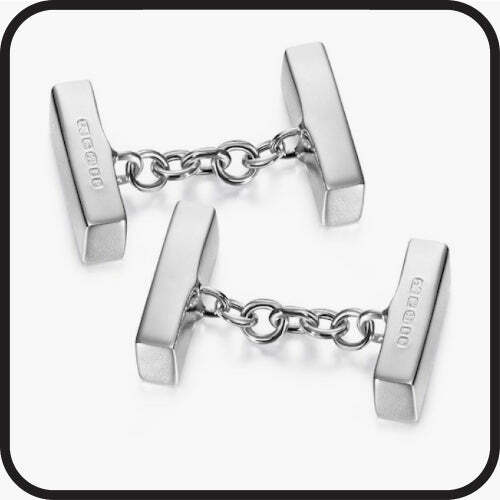 Locking cufflinks work with a dual action (for the face and backing of the cufflink) foldable locking mechanism. They can easily slide through the cuff holes, then each end is unhinged and locked into place holding the cuffs together. It is a simple and elegant system. These are one of the most common connectors and are used primarily with the bullet and torpedo backings. These connectors have a "Y" shape with the "V" portion housing the toggle between the sides. 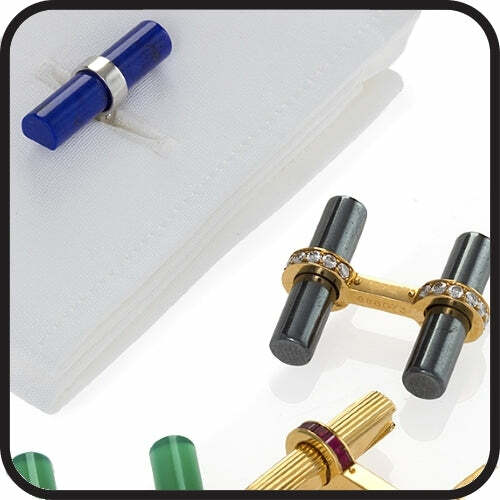 The vertical part of the connector then connects to the face of the cufflink through a variety of methods. 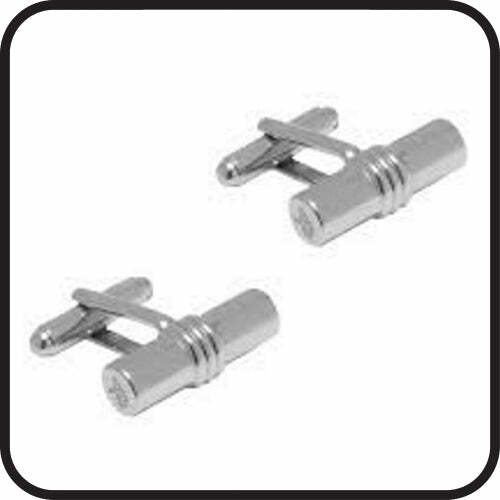 There are still companies making this interesting connector, but they are more common with vintage cufflinks. The backing and face button and snap together forming the connector function. 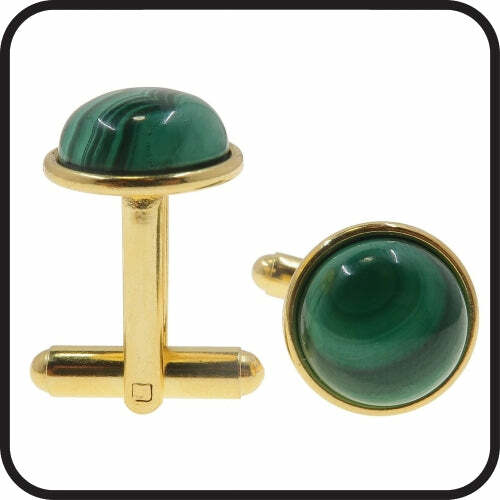 Most snap cufflinks have the face and backing the same size and could have the same or different designs allowing them to be reversible. The design of the snaps allows for each half to be independently inserted in to the cuff hole and not fall out. Does this seem like a complete list? If you think there's anything missing, please let us know in the comments below. The Beginning of a New Budget Day Tradition? La Polo - It’s Time You Should Take Your Cuffs Seriously!